WITHIN REACH explores one couple's pedal-powered search for a place to call home. Mandy and Ryan gave up their jobs, cars and traditional houses to "bikepack" 6,500 miles for nearly 2 years around the USA seeking sustainable community. Rather than looking in a traditional neighborhood, they begin to recognize that community is the secret ingredient to living sustainably on this planet. Along the way, they explored 100 Ecovillages, Cohousing Communities, Co-op Houses, Communes, Transition Towns and their own principles and commitment. In the end they return to the timeless truth that community is people; they are everywhere; and there is room for everyone. Communities they explored include: The Establishment Co-op, Regen Coops, LA Ecovillage, Sonora Cohousing, Transition Alpine TX, The Farm, Earthaven Ecovillage, Cobb Hill Cohousing, Ecovillage at Ithaca, Dancing Rabbit Ecovillage, Possibility Alliance, Joyful Path Meditation and Healing Center, Greensburg GreenTown and Hummingbird Community. Both their journey and their ﬁlm have answered the question that they and many others are asking: How can we pass along a lush, beautiful, sustainable world to future generations? After circling the country and interviewing hundreds of Americans, they have found that by reaching within, sustainable community is Within Reach. In fact, it’s already here. After bicycling 6,500 miles around the US to visit 100 sustainable communities over several years, Mandy now resides at Dancing Rabbit Ecovillage where she is co-producing the Within Reach documentary. 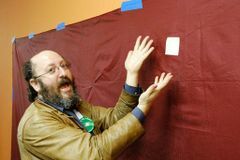 Cohousing California regional organizer Raines Cohen joined the film team for some small parts of the journey, and connected them to the larger intentional communities movement, making key introductions and providing the "talking tandem" bicycar "cohousing coach" seen in the movie. He has visited over 100 US cohousing neighborhoods, lived in two, and advised many.